The first year of SAVES 2 project has come to an end at the University of Bucharest. What a project!!! It made everybody realise that their actions are part of a common goal. 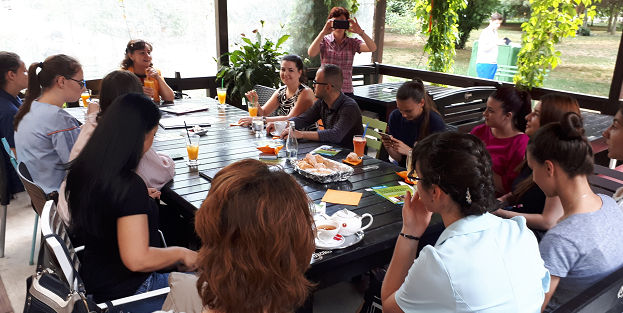 Two important events took place to mark this: University of Bucharest hosted a project meeting of all the European organisation delivering SAVES 2, and in addition, we celebrated the students and their efforts in saving energy in their dormitories. These two meetings were great occasions to reflect what went well and what needs to be improved during the second year of the project. The student ambassadors’ role is crucial in the process of sharing energy saving knowledge, of changing individual and group behaviours. What our ambassadors think about the first year of SAVES 2? Alina Simion Faculty of Geography, became an ambassador “because of interest in having an experience of being involved in a project with a positive impact on the environment”. She received new information about how to save energy, but the most important thing is that Alina learned to switch off! Ioana Fidel-Miu, Faculty of Physics, wanted to become an ambassador in order “to discover new things and share with her colleagues”. She made lots of great friends and, together with other two ambassadors from her campus in Măgurele, started to be more and more involved in promoting the SAVES 2 activities. She believes that they can transmit the information on saving energy to their colleagues and friends and she also wants to be an ambassador for next academic year. Alina Mihaela Ene, Faculty of Letters, believes that we need to better at promoting the SAVES 2 activities in mass media, that we need to organise trainings for ambassadors that involve marketing and communication skills, and that it is also important to reach out to many sponsors” in order to diversify the prizes for the student competitions. Therefore, lessons learned from one year of SAVES 2 are a good start for next actions. We are ready for the coming academic year and proud to continue being a part of European project on saving energy! We will develop our activities based on a more efficient communication plan, involving more professors and experts from NGOs who work on environmental issues. We will be open to students’ ideas whose creativity is reflecting their youth, energy and enthusiasm. Having fun and saving energy have become so compatible under SAVES 2!